Thanks to everyone who visited over the two weekends. I think there were about 150 in total. 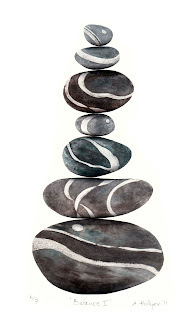 I sold all my new pebbles prints which I was very pleased about plus the new coasters were also a big hit. Something to think about if I do another Christmas show this year. I also visited several studios myself most notably *Amanda MacPhail in Cottenham, Chris Wood in Stretham, Terry Beard and Stephen Mufitt in Wicken and *Emma Mitchell in Reach. All really talented people, *'s indicated where I couldn't resist buying a few things. One more weekend to go. The weather forecast isn't great, so hopefully people won't be going to the sea-side, gardening or going to summer fayres and will instead have the urge to visit some of the 240 artists taking part in Cambridge Open Studios this year. Check the website to see who is open on which weekend. My studio will be open from 11am - 6pm, 16th & 17th July, and there is another artist, Chris Thomas, in the same street. 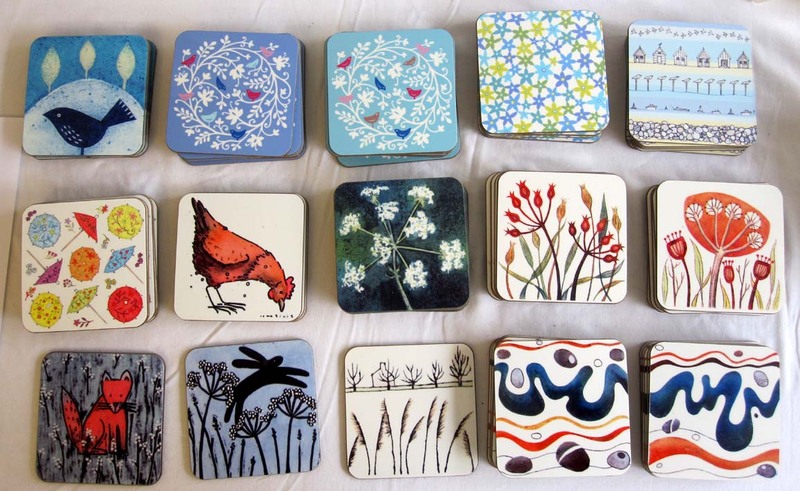 Some new things that proved very popular last weekend were some coasters I've had made, depicting 15 of my designs and prints. I sold out of a few of the designs so have re-ordered and should have the new ones in time for this weekend. 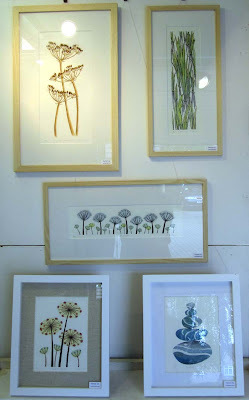 My first Open Studio weekend went well. 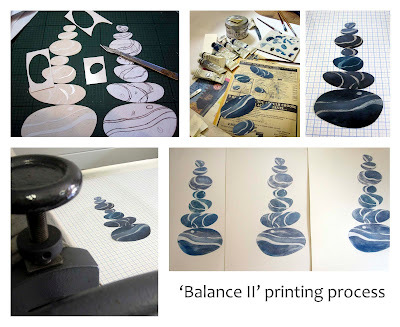 I sold a couple of my new balancing stone prints and I thought you'd like to see the process. The printing plates are made of card so they are easy to cut into shapes, so I thought I'd move away from the traditional rectangle and cut them into pebble shapes. I painted them with oils and carefully arranged them on the press. I had to place the paper on top of the plates very carefully as I was worried I might move the arrangement. But they all stayed roughly where I put them and I'm really pleased with the result. Only a little bit of watercolour was added to the final print to enhance the shadows. 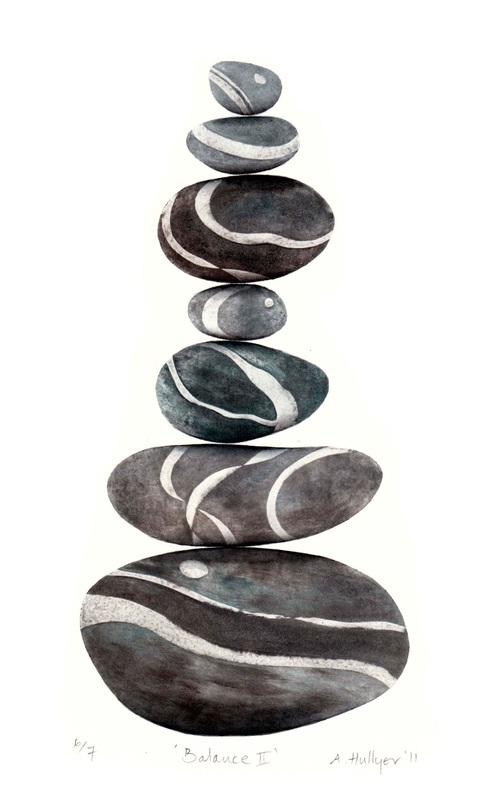 I printed seven with seven balancing pebbles and five with five pebbles.